As soon as we left Kings Dominion we were back into bumper to bumper traffic that would take us toward the nation’s capital and we would spend the better part of three hours getting there. If I haven’t said it before, living in Alaska we don’t have to deal with a lot of traffic. True, I now get aggravated when I have to drive through Wasilla, yep that town where Sarah Palin is from, and it only has about 8,500 people. Nothing prepares you, or can you compare, to the traffic in the DC area. It stretches for miles. In fact I think its really just one big traffic jam from New York City to about Richmond, Virginia. This area would be our stomping grounds for the remainder of the trip. We gave the go cart all she got and soon I realized that I had been driving it in third gear for the better part of 1,000 miles! The car had a shifter that you could move from 1, 2, 3, and then move over to the left to D. No wonder I couldn’t go over 60! The little hamster-mobile had been screaming from Baltimore to South Carolina and now half way back! I quickly shifted it to D and Michele called her dad. He said don’t worry about it, its a rental. Just don’t say anything when you turn it in. As we worked our way around DC and into Maryland we had finally got the go-cart up to a comfortable 70 miles per hour. At least now we were keeping up with the flow of traffic. As dark filtered in we entered Pennsylvania and the landscape immediately changed. No longer were we in the hustle and bustle of the big city and it’s concrete jungle but now we were in rolling farmland. There were miles and miles of pasture for horses and the traffic thinned out. I commented to Michele that we were still in the suburbs of DC and that many people paid for the opportunity to live in such a welcoming place. We found a hotel on Priceline as we pulled into Gettysburg and checked in. It was the Wyndham Gettysburg Hotel. It was a beautiful place. Aside from the room on the 12th floor of the Sheraton on Myrtle Beach, this was the nicest hotel we stayed at so far and we got a great deal on the room. When you entered the hotel there is a huge civil war canon in the lobby and everything is decorated like a northern mansion in a presidential motif. It was close to 10 pm and we needed to eat. Our last meal seemed like days ago when we munched on the too-expensice-theme-park-food at Kings Dominion. Not much was open at this hour but we found a little place, The Lincoln Diner. It was a cool place and reminded us of those roadside dinners from the 1940’s. We grubbed on sandwiches. Mine was an excellent patty melt and fries. We headed back to the hotel room with the ultra-comfortable beds and planned the rest of our trip. Do you remember how I said we were traveling on a loose itinerary and we would just go with the flow? On the way north towards Gettysburg we decided to take a bit of a side trip. We still had three nights left and decided we would see the civil war stuff in the morning, drive over to Philadelphia in the afternoon and then drive to New York City and have dinner in Times Square! 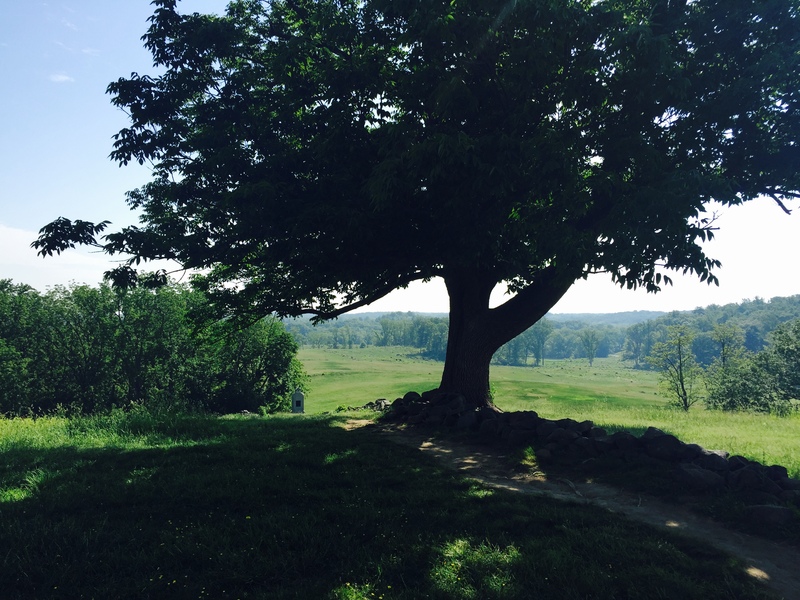 We woke up early and began to drive around Gettysburg. 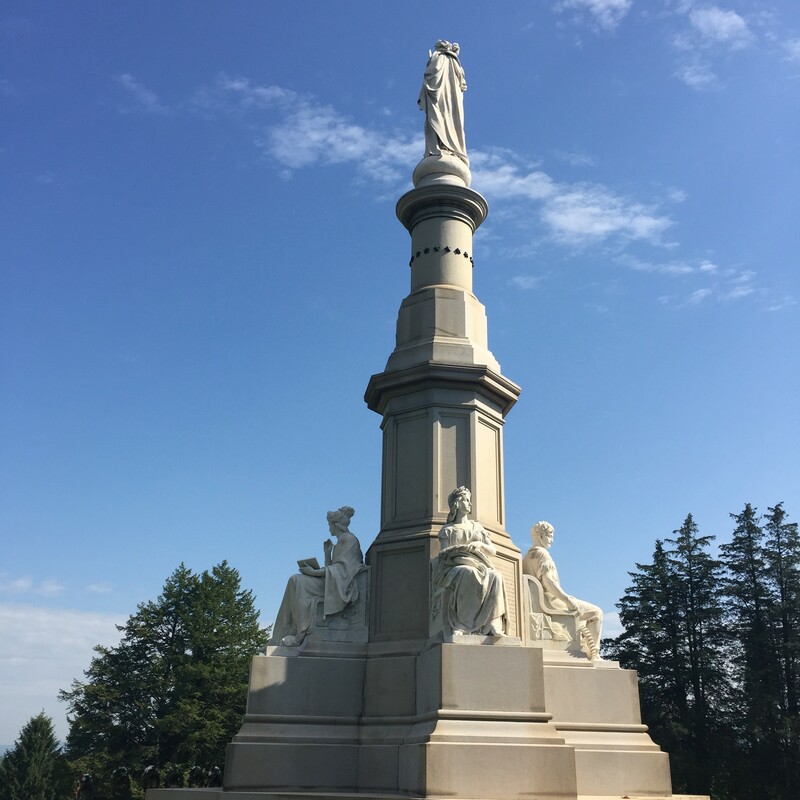 Michele and I have always been big history buffs and we knew when we started to plan this trip that we wanted to visit Gettysburg. We watch a lot of The History Channel, documentaries and history based movies and this was a place I had never been before. Our first stop was the cemetery. 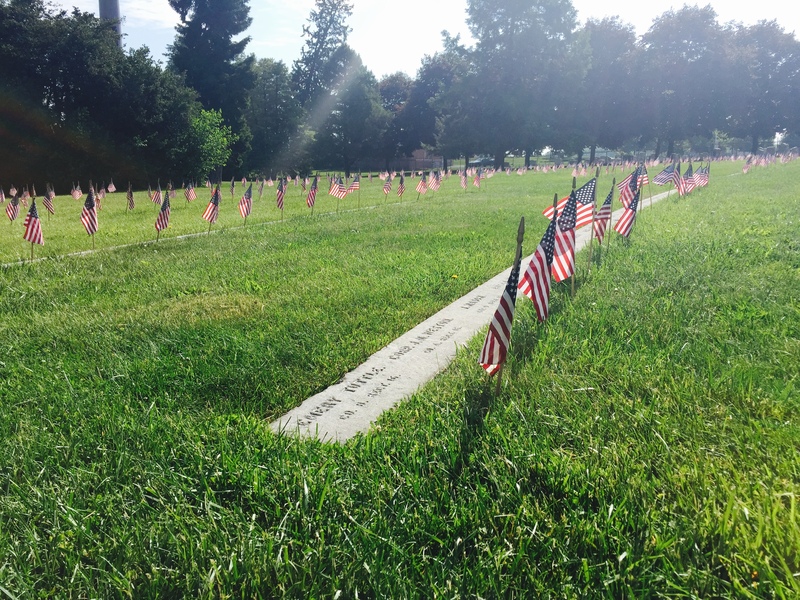 Since it was the day after Memorial Day all of the flags were still lining the graves. The cemetery is divided up into sections by the states. It looked like most of the soldiers that were buried were from New York. After walking around and paying our respects we walked up to the place were President Abraham Lincoln gave his Gettysburg address. Contrary to popular belief the President didn’t speak on a podium flanked by his staff like he does today. There is a picture of a man “who is presumed to be Lincoln” just standing in a group of a lot of like-dressed men at this very spot where he gave his historical speech. We then crossed the street and walked on the hallowed grounds were hundreds of soldiers died in the days leading up to Independence Day during the bloodiest battle in our nation’s history on our soil. 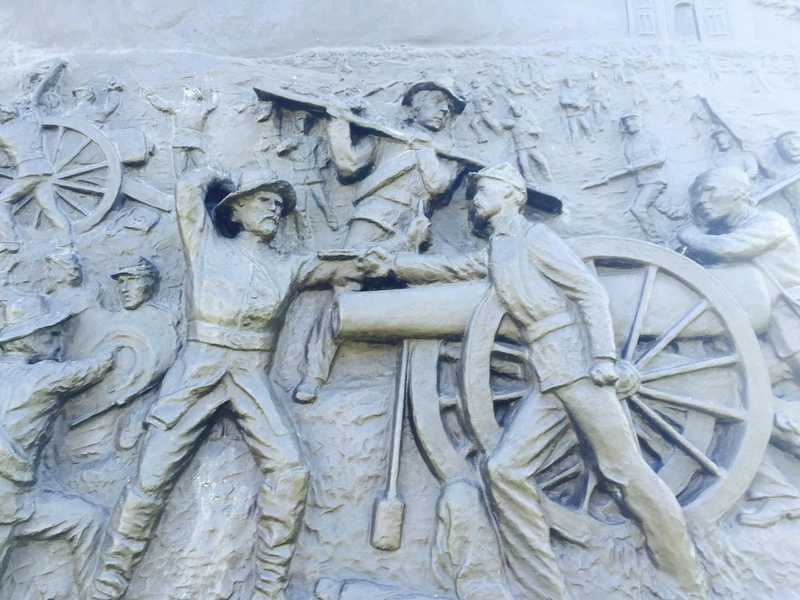 There are lots of monuments of generals and military leaders and canons that are pointed down the hill. I can only imagine what the residents of this town thought during the days of this conflict. We saw the home of Ginnie Wade, the only civilian killed in battle. She as hit by stray fire. We then started our driving tour of the battlefield. This took us about and hour and a half. We stopped at points along the tour to look at some of the key places in this war. We climbed up the tall observation tower and got a birds eye view. 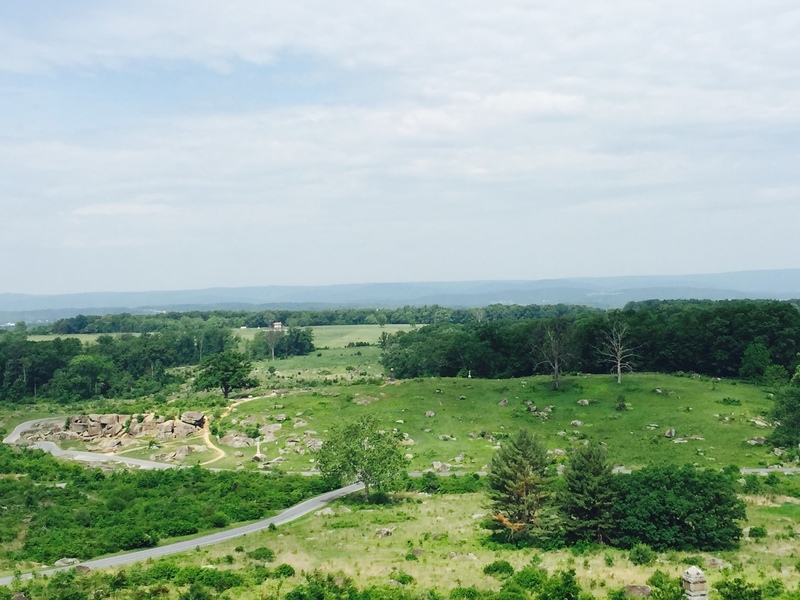 We stopped at Little Round Top, made famous in the movie Gettysburg that starred Jeff Daniels. We listened to a park ranger tell the story of this place in history. What is interesting at this park is you can take a tour with a park guide where they ride with you in your car and give you a personal tour. I have never heard of anything like that before. After we drove the loop around the battlefield we knew we had a long drive ahead of us so we were on the road by 10:30 and headed to Philadelphia. Our drive to Philadelphia was very interesting. We were on the Pennsylvania Turnpike the whole way and we literally drove downhill for more than 140 miles! I am not joking. I commented to Michele several times that we have not driven uphill at all the whole way on this portion of the trip. 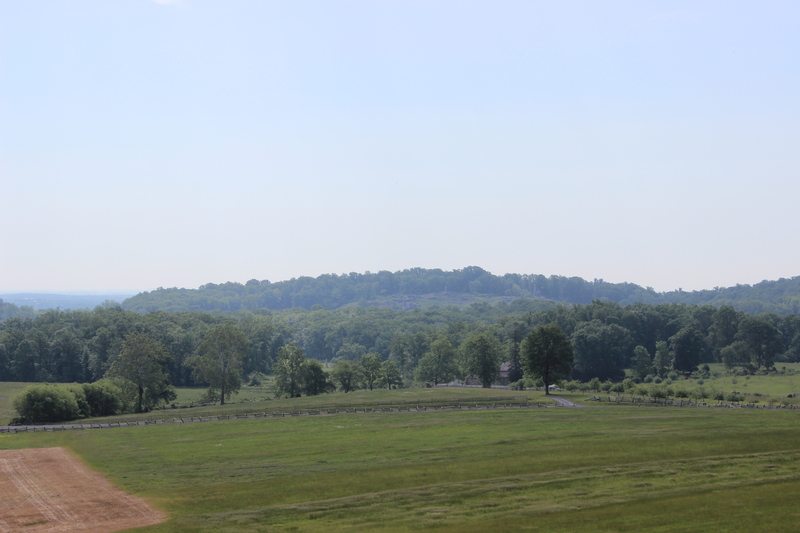 The middle of southern Pennsylvania is rolling farm country full of grassy meadows and small little communities. You are on a toll rode for the entire drive so we didn’t get off to do any exploring. Visiting Philadelphia was on again, off again, on again on our trip. 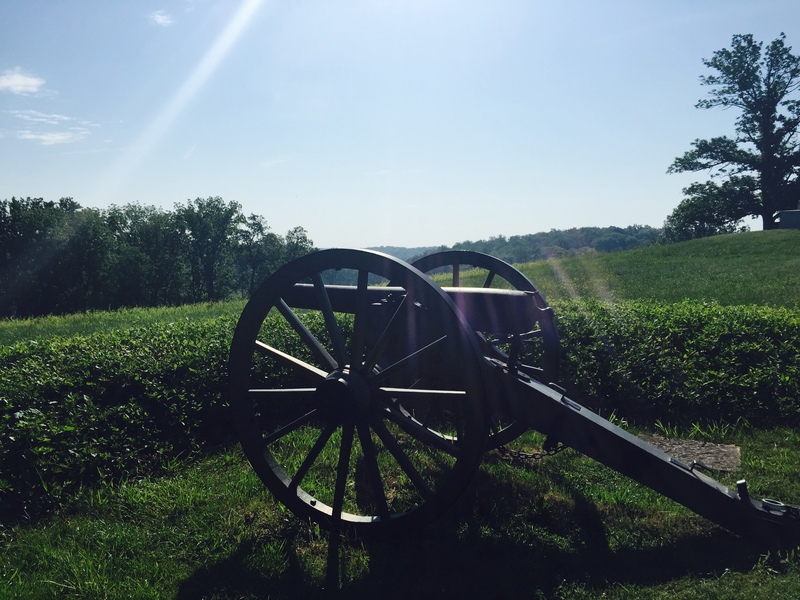 It was 140 miles from Gettysburg, just a couple hours in the go-cart. As we entered the city the first thing we noticed was how dirty and how much graffiti was everywhere. Our plan was to grab lunch at the world famous Geno’s Steaks then head over to see Independence Hall and the Liberty Bell. 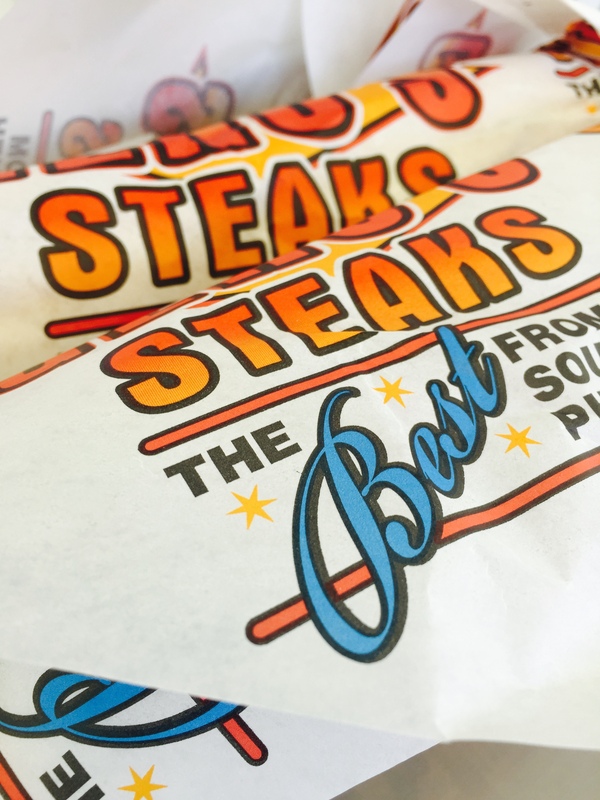 Geno’s cheesesteaks are a Philadelphia original and they are excellent. This little sandwich stand is not in the best part of town but there were plenty of people lined up to grab a bite. We ordered two sandwiches ($10.00 each) fries and drinks and stood at the counter and ate. They were awesome! The sandwich shop is directly across the street from its rival, Pat’s King of Steaks and you could see people contemplating on which one to visit. We headed through the busy streets to find Independence National Park which is in the middle of the city. The long hall that houses the Liberty Bell is across the street from Independence Hall and there was a long line to get past security to see the bell. I remember thinking when we visited this when I was a kid, what is the big deal. This is a pretty small bell to fuss this much over. But today as then, many people do and many tourists from all over the world were here when we visited. Many of them posing for pictures in front of the bell. Did you know: No one recorded when or why the Liberty Bell first cracked, but the most likely explanation is that a narrow split developed in the early 1840’s after nearly 90 years of hard use. In 1846, when the city decided to repair the bell prior to George Washington’s birthday holiday (February 23), metal workers widened the thin crack to prevent its farther spread and restore the tone of the bell using a technique called “stop drilling”. 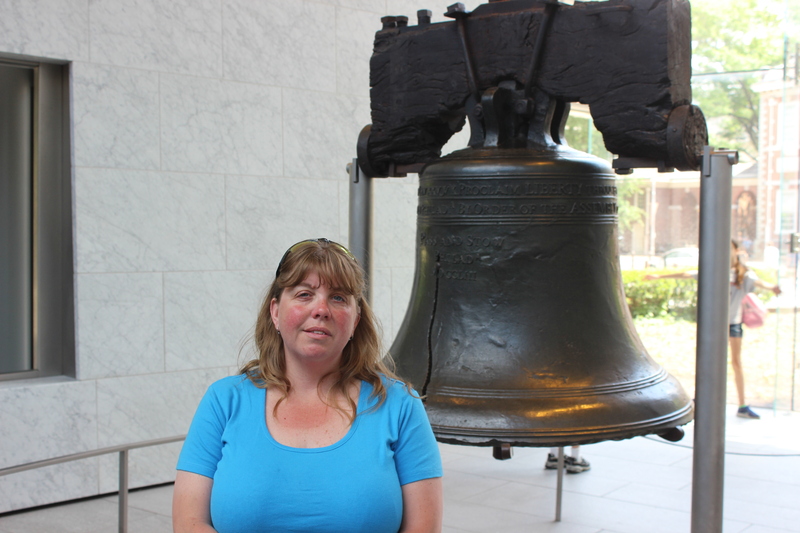 The wide “crack” in the Liberty Bell is actually the repair job! Look carefully and you’ll see over 40 drill bit marks in that wide “crack”. But, the repair was not successful. The Public Ledger newspaper reported that the repair failed when another fissure developed. 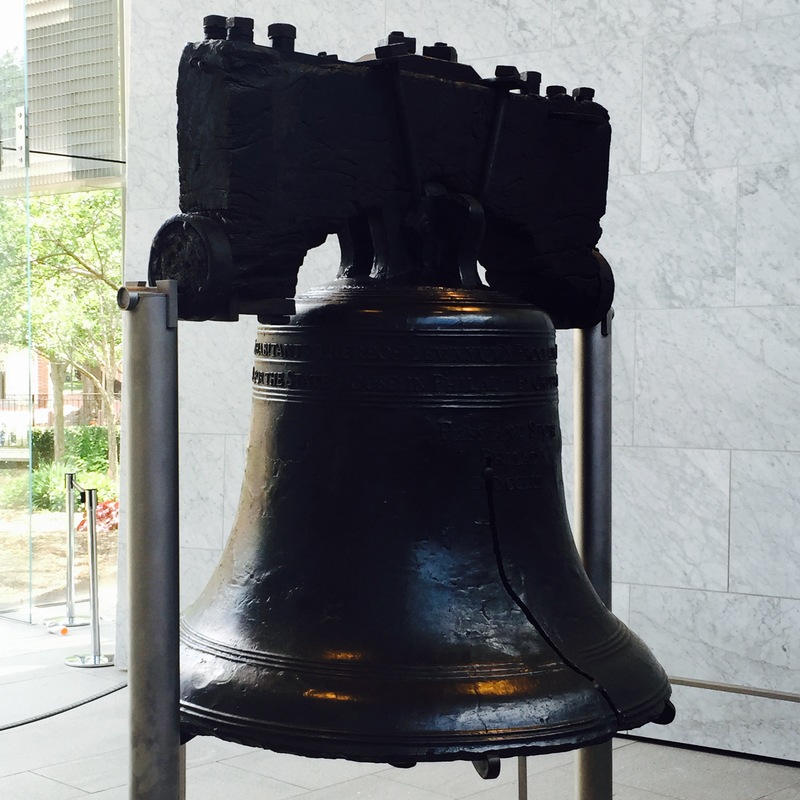 This second crack, running from the abbreviation for “Philadelphia” up through the word “Liberty”, silenced the bell forever. No one living today has heard the bell ring freely with its clapper, but computer modeling provides some clues into the sound of the Liberty Bell. 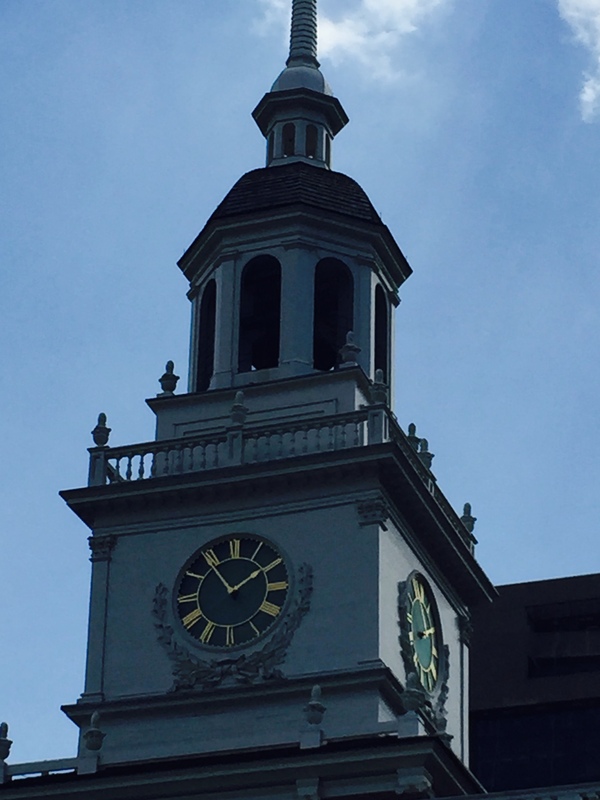 After visiting the bell we walked across the street to Independence Hall. Security is very tight here and there are police and park rangers everywhere. We decided not to go in. We wanted to. We had just watched the History Channel special a few weeks ago, The Sons of Liberty, and wanted to put a place to the show but it just wasn’t worth waiting in line. We were back on the road over the huge bridge and into New Jersey around 1 pm. Google Maps took us on the scenic route and it was a maze of twists and turns through the city trying to find our way back to the turnpike. We eventually found our way back to the toll booth and stopped to fill up the tank in the go-cart. New Jersey is a full service gas station state and Michele got hit on by the lady with gnarly neck tattoos, filling us up while I was inside changing into shorts. The drive on the New Jersey Turnpike was nice, at least until you get close to Newark, 90 miles to the north. There are lots of trees and a smattering of cities along the busy route north toward the Big Apple. We did not have a place to stay and our plan was to stay in New Jersey and ride the train into the city for dinner. Michele was checking Priceline while I was texting Mark, my mom’s husband. He grew up in this area so he was telling me where to go. I was doing all of this while driving 20 miles an hour in rush hour traffic. As we approached we saw the factories or whatever they are called, along the side that were made famous in the opening scene of The Soprano’s show, and the busy Newark Airport. We found a hotel, a Howard Johnson, that was close to the train station and decided this would be were we laid our heads. We drove up to the hotel and I was immediately put on guard. This looked like a rough place to be but we went inside to pick up our key. Priceline such a cool way to book hotel rooms on the fly but you never really know what you are getting until you pull up. The way we traveled on this trip we didnt take the time to read all of the reviews to see what people were saying. If the price was right we booked the room. We entered the lobby at the same time a couple was arguing with the desk clerk about walking six miles to get here and he wouldn’t rent them a room. It looked like they had everything they owned with them and I guess were planning on living at the hotel for a while. We paid our 130 bucks and drove up the long, steep driveway to the top of the hill where I our room was located. I remarked to Michele that this hill would be a nightmare in an ice storm. It was literally straight up. The room was basic, but clean. Once we were inside we found a place under the bed to stash my laptop. I don’t know why. If someone broke in don’t you think they would look under the bed? No, we will just take what we see on the counters, no reason to look under the bed, people don’t hide things under there! After a few minutes we were off on our next adventure to find a slice of real New York pizza. We are going to do things a little bit different on the next post. I have been doing them daily and ending with the night at the hotel, but on the next post it will take our readers to the Big Apple and then into the next day as we make our way to Coney Island and back down south.